Belgian waffles, chicken & waffles (my personal favorite), waffle cones… Everyone loves something that is waffled. You wouldn’t believe the number of different foods you can throw into the middle of a waffle iron and result in a crispy, textured delight. 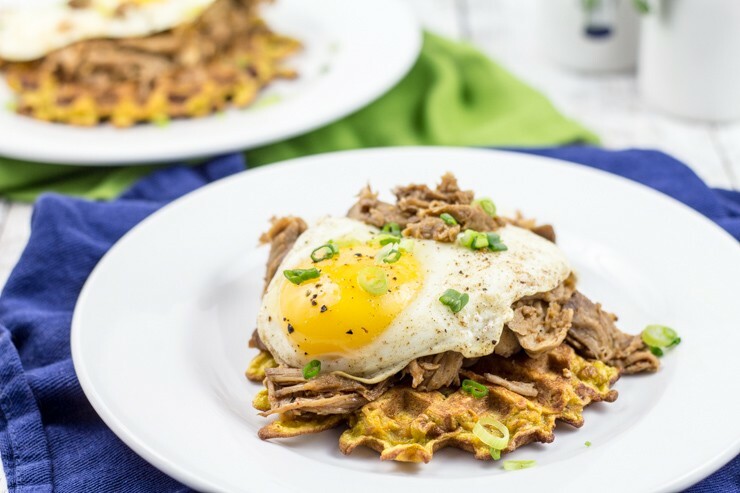 Sweet Potato Pulled Pork Waffles are the latest successful result of our waffling experiments. Errrryday, I’m wafflin’! — Waffles are a breakfast favorite for good reason. Pressing batter into a hot iron gives the treats a great texture that adds unique character to an otherwise flat and possibly bit boring breakfast. That added crisp leaves a beautiful template for adding toppings or sauces on top without having to worry about it all running off. Nobody wants to lose any their precious syrup, do they?! Nope. Here in the South, it’s just something that you do. Grits, biscuits, pancakes, maybe some country ham. It was like a special dinner treat. Sorta like that one time a year your mom lets you eat ice cream for breakfast. Or maybe when you sneak a Little Debbie cake from the pantry after school before dinner… Not that I’ve ever done that or anything. This is the best of both worlds. You get a nice breakfast feel with the crispy sweet potato waffles, along with a legit dinner entree of homemade puled pork. Since we couldn’t possibly stop there, we’ll just go ahead and add a sunny fried egg on top with a bit of sriracha. 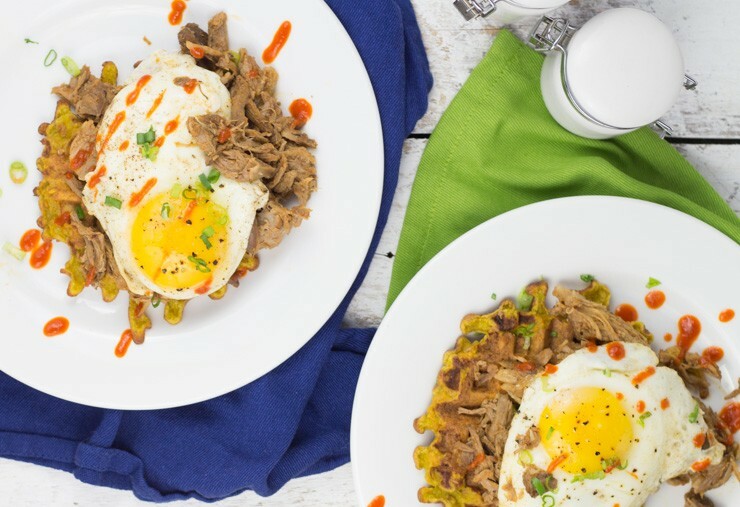 Because, well, SRIRACHA! The sweet potato waffle is certainly guest of honor at this dinner. It’s light, fluffy center with the crunchy edges is the absolute perfect bed for the rich pork and fried egg to rest on. Treat yo’self! — You won’t regret this one. —Enjoy! Check out our Pulled Pork BBQ recipe here! 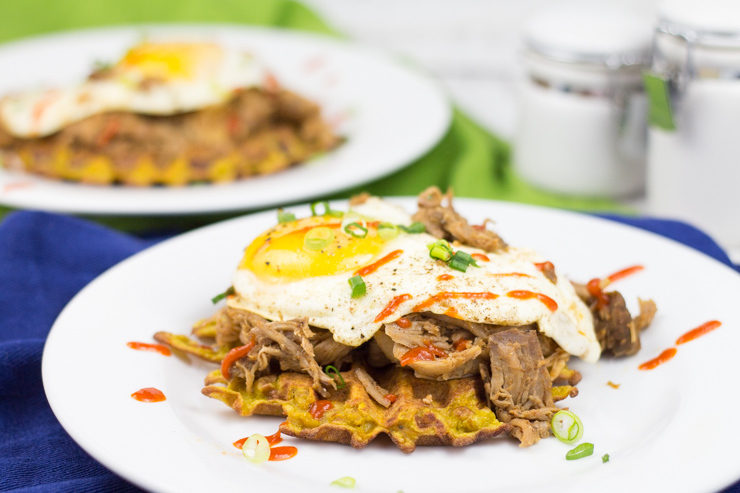 Crispy, simple sweet potato waffle topped with homemade pulled pork bbq, fried egg, and sriracha. 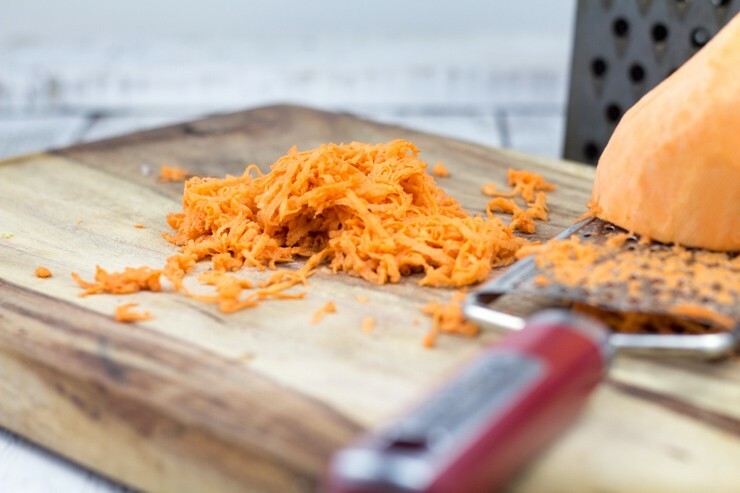 Squeeze grated sweet potato in cheesecloth or paper towel until moisture is removed as much as possible. Combine and sift flour and baking powder well. Combine grated sweet potato with other ingredients. Add the optional milk if needed for a thinner consistency. Cook in waffle maker by manufacturer instructions until exterior is crispy. 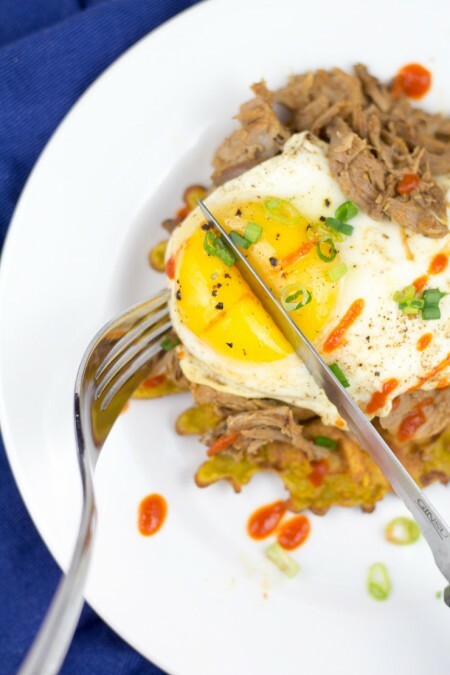 Top with pulled pork (CLICK HERE for recipe), fried egg, sriracha and green onion. Visit SouthernFATTY.com for more recipes. Breakfast for dinner. Yes or no? Comment below! This sounds so freaking delicious! 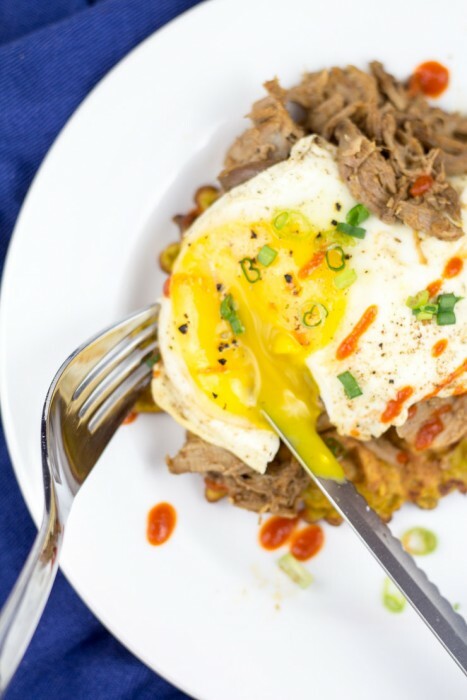 This is definitely going on an upcoming brunch menu at my house, because I can’t get enough of any of those ingredients, let alone in one delicious meal! I’ll keep an eye out for my invite! Tried these waffles and they didn’t quite work out for me. I picked a “large” sweet potato and grated with my food processor. Can you estimate the amount of sweet potato you ended up with because I’m guessing I had way more than you did. Did you use a microplane, or a smaller-than-average sized grater? I then had to double the amount of flour, butter, eggs used just to get anywhere close to coating the sweet potato. My end product was no where near waffle batter consistency so I just ended up making the mixture into fritter shapes and frying them in the same pan I fried the eggs. Tasted good, solid seasoning, just not waffles. The pulled pork is killer, though. Made my house smell so good all day I could hardly take it. Oh no! Hate to hear that. I want to say that I ended up with about a cup of shredded sweet potato. I used a box grater, so probably equivalent to a fine grate on a processor. I suppose I should have realized that “1 sweet potato” isn’t the best measurement… hah. I’ll see if I can make these again soon and update it to be more clear. This was an on-the-fly idea I had that turned into a post after enjoying it more than I had expected. Glad you enjoyed the taste. The fritter fix sounds pretty good! — I’ll yell when I get things more clear for you. Gah, this sounds incredible! That runny egg on top is making me swoon. You need to put Au Bon Pain out of business and open your own wafflin’ place! Evvvvverythang is better with an egg! Yesssss. This looks amazing! We have a restaurant here in Chattanooga that serves Irish boxties topped with pulled pork…this made me think of those! 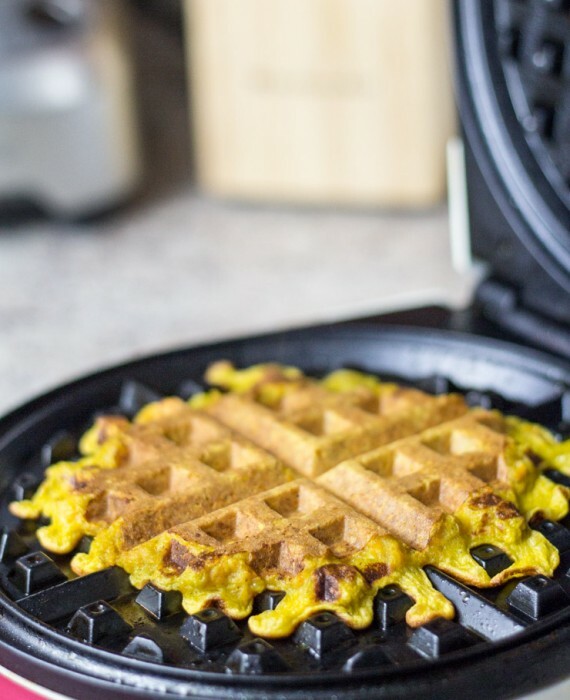 Sweet potato waffles sound delicious-I’ll have to make those soon! That sounds delicious! I’m passing through there now, actually. I’ll have to stop on my way back and find a good place to eat! Let me know if you need suggestions! I know all the best spots! I’ll probably try to find a good BBQ place close to the interstate, since I haven’t tried many in Chat… Def welcome any suggestions! OMG! I need this in my life! I’ll be making this fish very soon! Had me worried for a moment… Hah! WOW I love these!!! I’m totally obsessed with sweet potatoes at the moment and with the pulled pork too, winner! First your salt crust potatoes, now this! I want all your potatoes, all the time. Take from that what you will. Bahaha – Love my spuds!